How can a good concrete garage add value to your home? A well-constructed concrete garage, whether converted into an additional room or for storage can add financial value to your home. This is because, according to leading estate agents, families still consider a garage a vital component when buying a new property. If you are looking to develop your garage, there are a few things to consider in order to maximise the financial return. These points include the potential, the location, and the price of your house and how this could impact on people’s perceptions and opinions of your home. This is crucially important for when you are considering moving home. Looking at these initial three areas in depth we can spot some of the advantages and disadvantages within each section. With the potential, if your house currently does not have a garage and there is space to expand, a new concrete garage will certainly improve the qualities of the home. A well-built garage will provide a fresh covered car parking space, whilst also lending itself to additional protected storage. This will add value to your home with the profit margin fluctuating depending on area. 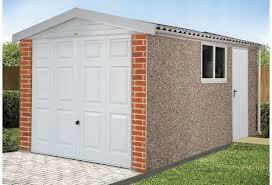 With new garage builds also competitive in price, there could be a large value in adding a garage before you sell. If it does have a garage already, potentially improving the roof or adding a new door that creates more useable internal space can be a cheap option and may offer a prospective buyer a better mindset of how the space could be used. The final point initially raised about your existing home is price tag. If you are looking for a return on investment quick then getting a basic garage is what you are looking for. However, if long-term value and functionality are important, then paying out a bit more could see your house price move into another housing bracket and buyers may want a home with these qualities. After considering these three points, the other option is a good and well thought out garage conversion. If there is enough parking on your driveway for multiple cars already, and another area such as a shed for garden storage or tools, then a conversion can create additional space. A conversion to any type of space will add some value to your home. Converting into a utility room, bedroom or home office will be a profitable option, as would a bedroom with an en-suite bathroom could add a lot to your houses’ value. Going from a three bed to a four bed house immediately attracts a different type of buyer and puts your home in an improved price bracket. With this option, the more you are willing to spend the greater the return on investment. As with all home changes there are risks. Building a concrete garage from Dencroft Garages will add value, and from then converting into a bedroom even more. However you have to also think about practical elements and how you want it to work whilst you live there. With the current house market in the UK also at a low, it may also be an investment you have to live with for another five years.